Statistics will tell you it was the worst season in MK Dons' history. Not many will hold their heads up high going into the summer break, but one can - Callum Brittain. Before the first team Player of the Year awards were unceremoniously canned, it is understood the youngster wasn't in the top three as voted for by the fans, but given how the season has panned out, he should have been number one on everybody's list. Rapidly becoming one of Dons' biggest assets, he is highly thought of by chairman Pete Winkelman, who backs him to play in the Premier League sooner rather than later, while his season with England U20s will have alerted top clubs to his abilities too. It has been a breakout year for the 20-year-old. Making a handful of appearances last season, Brittain was largely among the substitutes and Cup squads under Robbie Neilson in the early offing. But injury midway through the first half against Oxford United on September 2 proved he was ready for a starting berth. A cracking display against the U's saw him fire in the all-important equaliser and from there, he barely looked back. A regular from then on under Neilson, he kept out Player of the Year George Williams as he made the right back position his own. Brittain's performances were industrious. He was up and down the right flank, brave, and exciting - a rarity for a right back. England U20s came calling shortly afterwards, and the Bedford lad was handed a new, long term deal to keep him at Stadium MK. Results weren't going right on the pitch though as Dons slumped down the League 1 table, and Neilson lost his job in January. Brittain's academy boss Dan Micciche took over though, and having known Brittain since he was 12, gave him a new, more advanced position on the field, the position he had grown up playing. Initially, his central midfield role was a stop-gap as he came on in the final 16 minutes at Rochdale. But a brilliant performance there a few days later at Fleetwood gave Dons some much needed bite in the centre of the park. "I know what Callum is capable of," said Micciche. "I trusted him in there, he has technical ability, a 360 understanding of the game, he's got legs and I had no qualms about putting him in there." Switching back and forth as Micciche tinkered with his system, Brittain's performances remained a constant. Leaving nothing behind, Brittain was one of very few in the team who looked like he was playing for the badge on his chest. 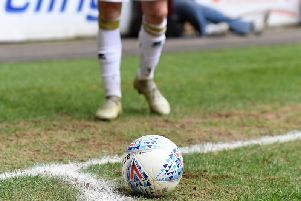 Even in the dead rubber at Shrewsbury on the final day of the season, Brittain was the only player on the pitch breaking a sweat playing football, rather than just because of the sunshine. His maturity was growing off the field too. From the nervous youngster interviewed for the first time after his Oxford goal, Brittain fronted up after the heaviest defeat of the season away at Wigan having scored the only goal in the 5-1 thrashing, and again when all hope was gone after losing to Bradford. Each time he was honest, critical of his own performances as well as the rest of the team. Despite Dons' relegation to League 2, Brittain vowed to battle on for the club he has grown up with, willing to put aside his England chances to get Dons back to League 1. Looking around the dressing room, not many would be willing to make that sacrifice.